The common octopus is one of the more interesting inhabitants of our local waters. Typically found offshore, these animals are often caught as bycatch by commercial fishermen. Both in the wild and in captivity, octopus are masters of disguise thanks to their chromatophores. These small sacs just below the surface of their skin will constrict or relax causing varying levels of pigment to appear which allows octopus to very quickly change colors and patterns. Known for their intelligence, these mollusks are the only invertebrate found to exhibit tool use – a trait typically reserved for higher order mammals. 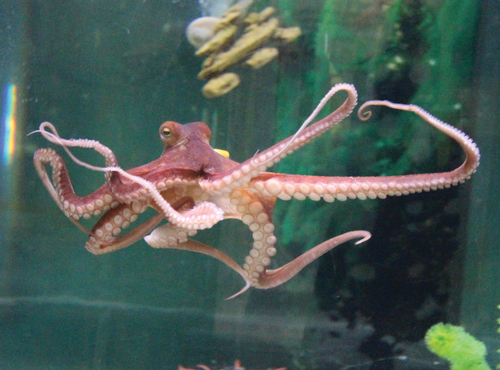 Because of their intelligence, octopus in aquarium settings have been known to get into all kinds of mischief such as escaping to grab a midnight snack from neighboring tanks. 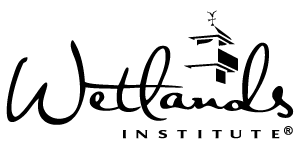 Our resident octopus here at The Wetlands Institute is no exception! He is a very fast learner and can open a variety of containers to get his meal of mussels, fish or crab. Just like a child, he has his favorite toys that he can be seen playing with throughout the day. 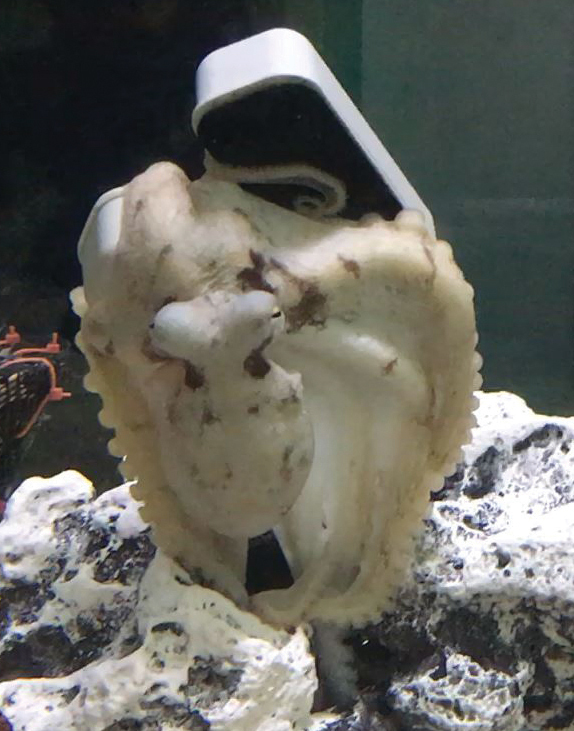 Right now, his favorites are a plastic screw driver and a floating ball, but nothing will ever compare to the magnetic algae scrubber used to clean his tank. He has been known to steal these scrubbers and hide them for days! When you come to visit, be sure to play a game of octopus tag – move from one side of the tank to the other and have our curious guy chase you!